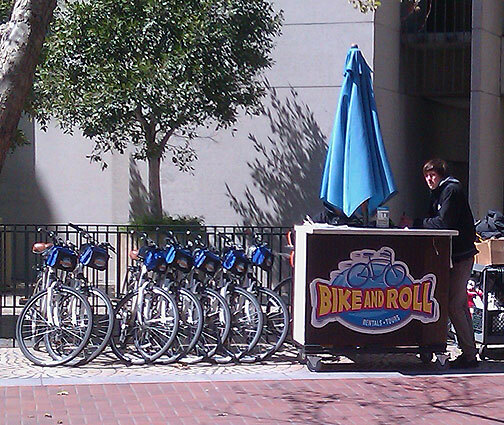 A Bike-and-Roll rental station in front of the Hyatt Regency at Market and Spear. I’ve been bicycling in San Francisco since the late 1970s so I vividly remember when almost all bicyclists could recognize each other on the streets of the city. There really weren’t that many of us even as recently as the beginning of the 1990s, just two decades ago. We’ve come a long way, and one of the less recognized aspects of this bicycling boom has been the incredible expansion of bike rentals and bicycling tourism. I wrote a flyer back in 1986 calling for a “City of Panhandles” and one of the arguments I made in that largely unnoticed document was that a systematic effort to provide safe, separate bikeways crisscrossing the City would itself lead to a tourism boom. As it turns out, we’re experiencing a dramatic increase in tourists cycling even before we provide adequate infrastructure. San Francisco is just an incredibly beautiful place, and people come from all over the world to experience its beauty. Growing numbers of those visitors aren’t much interested in seeing it through windshields and are opting instead (or in addition) to rent bicycles. There are three “big” companies doing bike rentals in SF: Bike and Roll, Blazing Saddles, and Bay City Bikes (a number of smaller places, like the BikeHut at Pier 40, also rent bikes). I recently spoke with Darryll White, owner of Bike and Roll, and he gave me some impressive aggregate numbers. Since 1995 the local bicycle rental business has grown from about $500,000 a year to over $10 million! The remarkable thing about this huge increase in tourist cycling is that about 90 percent of the rentals are heading to the Golden Gate Bridge and to Sausalito, where the City Council has erupted into battles over bike parking vs. car parking, even pondering charging fees to touring bicyclists. The Golden Gate Ferry service keeps at least four of its ferry runs going to accommodate the cycling tourists, which have hit peaks of 2,500 per day during recent summer months. 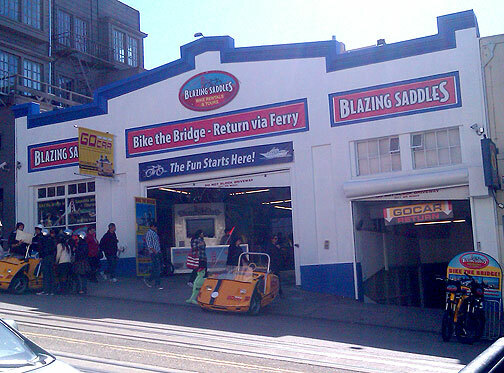 Blazing Saddles rents bikes and go-carts from its Hyde Street facility near Fisherman's Wharf. This past Wednesday I was buying food at the Heart of the City Farmers’ Market in UN Plaza and lo and behold, a mini-mass of 9 cyclists went rolling by on Market, heading westward. All of them were on Bike and Roll bikes, and I stopped to marvel at the sight. Imagine if there was a dedicated bikeway up Market that connected cyclists all the way to the Pacific Ocean? Talk about a tourist attraction! And since it would go right by the Haight-Ashbury, the museums in the park, as well as the Civic Center, imagine how heavily trafficked by cyclists from out of town this will be. As it happens the SF Bike Coalition is now promoting a plan to Connect The City, a version of crosstown bikeways, including a dedicated bikeway that runs from the Embarcadero to the Pacific Ocean by way of Market Street, the Wiggle, and Golden Gate Park. It’s a wonder that the politically powerful tourism industry hasn’t thrown their weight behind it yet. The bicycle renaissance going on across the world has an important connection to San Francisco (Critical Mass was born here in 1992) and thousands of cyclists come here for the beauty, the food, and the politics. If San Francisco were creating dedicated bikeways, and presenting itself as a bicycling capital, tourism from near and far would only increase that much more. The big three maintain a fleet of approximately 3500-4000 bikes and employ on average one mechanic per 100 bikes to keep those bikes rolling. New bike shops continue to open around town, showcasing the bicycle as one of the few growing business sectors that doesn’t require its workers to sit in front of computers all day, mining pixels. Commuters, messengers, and recreational riders have already radically expanded the use of our common public space by bicycles during the last twenty years. The challenge now is to really redesign the city’s streets to make safe, horticulturally and artistically designed bikeways as common as thoroughfares for cars. I’m not a big fan of capitalism or business, but it’s pretty obvious that if we build a beautiful system of bike boulevards, bicyclists will come to ride them by the tens of thousands. When they do, they spend a lot of money and keep a lot of our local economy going. What could be simpler? Transform a citywide network of streets to promote daily bicycling, promote it to the global tourism industry, and get ready for the boom, doubling and tripling the huge expansion we’ve already seen. It would create good, local jobs to remake the streets (design, reconstruction, gardening, maintenance), more to accommodate the increase in local cycling (retail stores, rentals, bikesharing facilities, workshops), and then a further increase as the tourists pour in to cycle across San Francisco’s beautiful landscape (tour guides, rentals, mechanics, restaurants, hotels, cafes)… Whatever diminishing of car and gasoline sales might occur would be more than made up for by an ecologically healthy, economically relocalized, bicycle-centric boom that increases San Francisco’s global profile as a trendsetter and a tourist destination. This is why I read Streetsblog, for articles like this. Great article. I entirely agree–bicycling is a great way for tourists to see the city, and investing in safe, tourist-proof bicycle infrastructure will result a substantial economic return as well as reduce danger and health-risks to city residents from tourists in cars. Not surprisingly, one of the perfect day’s itinerary is to rent a bike, ride to Sausalito and take the ferry back. What’s more surprising is that each day’s itinerary doesn’t involve a bike rental. For example, they recommend the tourist take public transit to Valencia Street and wander the shops, and then end up at the Castro theater for a movie. As we all know, this would involve miles of walking, but though a bicycle would be the perfect way to accomplish this itinerary and Valencia Street is one of the most bike-friendly in the city, somehow it didn’t cross the writer’s mind to mention biking was possible. I definitely wish we had tourist-friendly routes across the city that didn’t require fine-tuned insider knowledge and high-level urban biking skills that residents here have to develop out of self-defense. I also wish tourists renting bikes were given SFBC bike maps. The maps they are given can’t be any good since I see tourists biking down Fulton when there are safer, pleasanter options just one block away both north and south of them. Last week I even saw one poor soul biking with the traffic uphill on Oak (east of Scott) when if they’d followed the Wiggle they would’ve been so much safer and found themselves on much more interesting, friendlier, flatter streets. I walked into one of these shops recently and was really shocked to find them charging $10 for a San Francisco bike map. I really wish there was a way to provide these maps for free. Two comments: First, we just celebrated the 10th Anniversary of the Crissy Field restoration, which besides all the beautiful habitat, also gave us a multi-use path right next to a road with bike lanes! The feds have continued since then to outpace our local govt with bike facilities, and I’d like to recognize their contribution to this bike boom. Is this revenue? Is it actually aggregate revenue, or is it $10 million in annual revenue? During the 9 months I’ve lived in Civic Center area I’ve seen a surprising number of tourist on rented bicycles trying to find their way around… some using those silly hotel maps that are missing much of the City… they get very lost that way… I’m really happy to see folks venturing out like this! Shows bicycling is not just popular here, but elsewhere and they are game to try it here, too. Signage is key for tourists even more than locals, because they won’t have time to try different routes. For example, on the route you have above, it’s almost certain people will miss the turn from Lincoln to Ralston, because there is no sign. There used to be a faded one with very little info (just a 65 with an arrow) but that was removed last fall when some landscaping work was done there. Updating the existing signage thoughout the city. making it more visible, and fixing some of the amusing errors would be a far better investment than most of the ‘paint’ projects currently under way. This is def aggregate and NOT the Bike and Roll annual rev. Great article. Thanks for supplying the numbers behind what I’ve noticed on the streets! It used to be you only saw tourists bike along the Embarcadero to the bridge- now I see biking tourists in almost every neighborhood. Clearly these bikey tourists aren’t just shelling out money for bike rentals, but paying for hotels, food, etc. Hmm…I wonder if they’d do more shopping if the bikes had bigger baskets instead of those little handlebar bags. How do you propose convincing the business that reducing the cost is in their interest? I expect an increasing percent of tourists get directions from their phones. @bgoebel:disqus Oakland seems to be doing a nice job of making bike information available by distributing free copies of the new I Bike Oakland map at bike shops. I picked up a copy at Manifesto on Saturday. You can also get the San Francisco bike map for free if you think ahead to look for it online, but it would be nice if the printed copies were cheaper.